In an earlier post series, I talked about the pros and cons of typical materials in wooden cutting boards. I also compared plastic and glass made cutting boards to help you decide which is the best choice for your cooking style. If you are leaning towards a wood board, understanding the different grain directions that make up your cutting board is important as well. Below are my explanations and tips on the two major wood grain construction types you will see in the market. 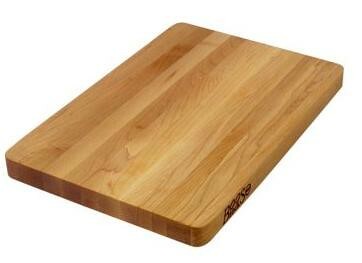 Most wooden cutting boards are flat-grained. They are constructed with the grain of the wood running horizontally across the board, as seen in the image below. Flat-grain wood boards are generally not as strong as the end-grain boards. When you cut on a flat-grain board, you are cutting across its grain. Over time, this cutting weakens the board surface. 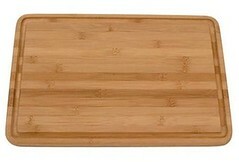 End-grain wood boards are constructed by having the grains of the wood run vertically on the board. This type of surface is like the top of a cut tree stump where the ends of the vertical wood grain (the tree rings) are seen. This cutting board usually looks like a chess-board when multiple end-grain wood blocks are arranged together to form a larger surface. This type of construction makes the board harder and more durable. It is the same reason why people chop wood on a tree stump. Choosing an end-grain board that is at least 2.5″ thick is best since they are more resistant to warping and cracking than the thinner end-grain boards. End-grain boards are also more resistant to knife cuts, since you are cutting along the grain. If you are a heavy-handed cutter, you may be pushing the knife down into the wood and even sliding apart the wood grains very subtly. But the vertical grains closes back up when the knife is lifted. They are not getting cut across as with flat-grain boards.